Rare-book expert Peter Fallon and his girlfriend, Evangeline, the main characters from Back Bay and Harvard Yard, are back for another treasure hunt through time. They have learned of an early, annotated draft of the Constitution, stolen and smuggled out of Philadelphia. The draft’s marginal notes spell out, in shocking detail, the Founders’ unequivocal intentions—the unmistakable meaning of the Bill of Rights. 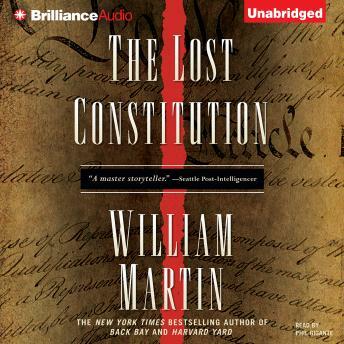 Peddled and purloined, trafficked and concealed for over two centuries, the lost Constitution could forever change America’s history—and its future. Moreover, Congress is already at war, fighting tooth and claw over the eternally contentious Bill of Rights. When word gets out of the lost draft’s existence, it launches a frenzied search, as both sides of the partisan machine believe it will reinforce their arguments. While battling politicians from both sides of the debate, Peter and Evangeline must get to the document first, because they know that if the wrong people find it, they will burn it, stripping the nation of its constitutional moorings. The search takes Peter and Evangeline into the rich history of America and New England, from Shays’s Rebellion to the birth of the American industrial revolution to the march of the legendary 20th Maine in the Civil War.